What if you could stop selling altogether and grow your profits? With The Serving Mindset, you’ll learn how to serve, elevate your business success, and feel great about it! Targeted to business owners and entrepreneurs who are very good at what they do but feel guilt and shame around selling and sales and therefore limit their own success and overall possibilities, The Serving Mindset: Stop Selling and Grow Your Business positions selling as serving and takes readers through the process of why and how to acquire this “serving mindset” and put it into practice. 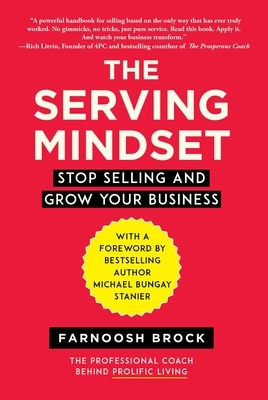 For readers who hate sales, The Serving Mindset will help you diagnose the source of the issue, understand how your mindset affects your sales directly, and discover a fresh approach to selling as serving—an essential lesson for enabling any business to explore maximum levels of prosperity. Using case studies as well as the experience of the author and that of her professional-coaching clients, The Serving Mindset is sure to change how readers view selling, serving, and growing. The powerful insights and applications in this book are game-changers for every business owner and entrepreneur who wants to attract and secure ideal customers and premium clients while maintaining integrity to his or her own core values. "The Serving Mindset is a "must have" book for anyone in sales or coaching. Farnoosh Brock has written a book which resolves any seller's issues by removing the idea of selling from the equation, and then masterfully provides a solution that still results in sales. This is a book you will want to read, re-read, highlight, dog ear, take notes, study, memorize and recommend to all of your friends.”—James Halsey, President, Atlantic Benefits Corp.